Please be aware that the way we test our video cards is not a like-for-like comparison, and it is not meant to be. The current state of the 3D world, where Independent Hardware Vendors no longer render things in a similar fashion, dictates that even an apples-to-apples comparison is no longer a true like-for-like comparison. We decided to concentrate on finding the \"Best Playable\" settings - this means that we\'re finding the best possible gaming experience delivered on each different configuration. There are no time demos used in our evaluations - we\'re focusing on the real-world gaming experience, which is, ultimately what should determine your next graphics card\'s purchase. VIA Hyperion 4.51 chipset drivers. MSI RX800 SE-TD256 - operating at default clock speeds of 425/800MHz using Catalyst 5.1. XFX GeForce 6600GT AGP - operating at its default clock speeds of 500/1000MHz using ForceWare 67.03 beta, available from NZone. The video drivers were left at their default settings throughout our testing, with the exception of enabling Geometry Instancing support in Catalyst 5.1. The MSI Radeon X800 SE is not too dissimilar in performance to a Radeon 9800 XT – ATI’s high-end video card from 2003. 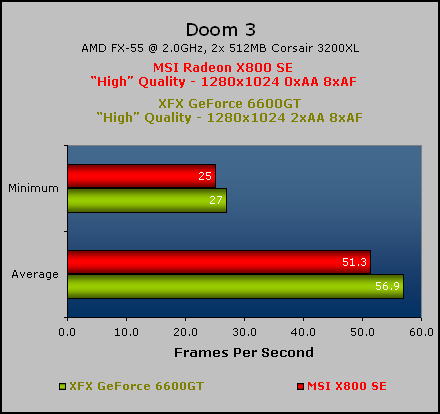 One thing that is worth pointing out here is that ATI still seem to struggle with the Doom 3 engine, and NVIDIA\'s GeForce 6600GT delivers a generally more pleasurable gaming experience. Aside from the lack of Anti-Aliasing, MSI’s Radeon X800 SE performed adequately in comparison to XFX’s GeForce 6600GT, delivering a solid gaming experience. We can only hope that 2005 will be a year where the Catalyst team devote some well-deserved time to developing ATI’s OpenGL drivers further. 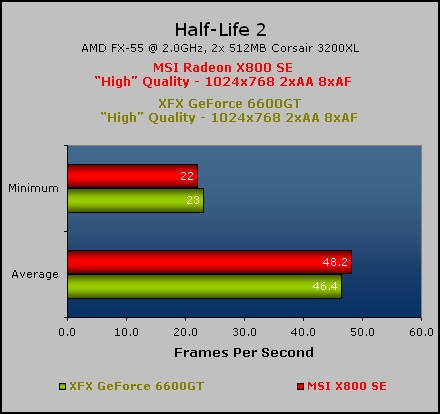 In Half-Life 2, we were somewhat surprised by the dead heat between these two video cards, with MSI’s Radeon X800 SE delivering a slightly higher average frame rate, merely two frames per second at the same resolution and detail settings. It would appear that NVIDIA have worked hard with improving their Half-Life 2 performance, but they have not managed to increase performance to an extent where we can improve the overall image quality. Both video cards performed well at 1024x768 with 2xAA 8xAF, but some of you may find that 1280x1024 with 0xAA 4xAF suits you better - I have found that image quality was significantly improved by increasing AA in conjunction with resolution in Half-Life 2 as, unlike Doom 3, the game environment is generally set during the day time. As always, this happens to be a matter of personal preference - you may find that other resolutions and detail settings are better suited to your own system configuration.